Last month, we compared the investment herd to the buffalo that were stampeded over the cliffs of the Great Plains by Native American hunters. Buffalo don’t meander over cliffs. Neither does the stock market. The stampede is on and investors won’t see that the ground has given way until it’s too late. Every time we hear that Greece has been bailed out and that it has ‘bought more time’, we just pull up a chart of the 1 year Greek Bond (chart below). 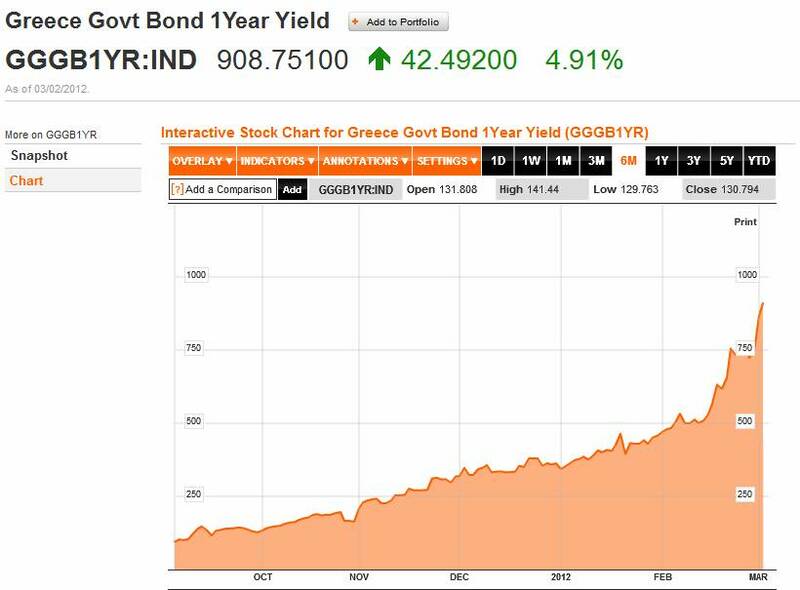 As you can see, the yield of the 1 year Greek Bond is greater than 900%. So despite the hope and hype surrounding the Greek debt situation, the market is telling us that the crisis has continued to worsen (and at a quicker pace!). In order to get its €130bn international bail-out package agreed to in February, Greece was forced to give the European Central Bank preferential treatment bonds at the expense of private bondholders. Ninety-five percent of these private bondholders must volunteer to take a 70% loss on their bonds by March 12th; otherwise Greece will face an imminent default according to S&P. More likely, if the hedge funds that hold the Greek bonds refuse, credit default swaps would be triggered (insurance bets that brought down AIG). Greece has also already been downgraded by S&P to ‘selective default’ on February 27th and to ‘default’ by Moody’s on March 2nd. Perhaps, the authorities will get it right over the next few days. But they can’t make people keep their money in the weak European banks. In January’s How European Failures Affect U.S. Investors, we stated that we expect credit downgrades to “deliver the coup de grace” on the “weak and leveraged banks of Europe.” This would “spark the contagion.” The European banks will have to hurry and fail if they are going to get ahead of the country of Greece. Fortunately, their depositors (especially in Ireland and Italy) have increased the speed at which they are pulling out their bank deposits (chart below). Perhaps, they might just make it. So what gives? The European situation continues to get worse, home prices (a.k.a. bank assets) continue to hit new lows, and the lack of auto sales have clogged dealer lots, but the overall stock market has surged since last fall. Surely, this has been because of improving corporate earnings expectations in the U.S? Not so. Fourth quarter earnings were the worst in two years relative to expectations. Wall Street has backed away from the earnings case we said was flawed last October. Instead as CBS MoneyWatch reports: “Fading optimism of analysts and business leaders was offset by fading pessimism among individual investors.” Ah, individual investors. So now, not only are the Greatest Investment Minds urging caution, but anyone looking at a number (other than price). And of course, the bankrupt salesmen are out pumping. The Shiller P/E ratio currently stands at 22. It was a pleasure to meet Jim Rogers last Wednesday in Birmingham, AL. To summarize his thoughts: the West are debtors and the East are the creditors. The East has an ability to make an income (manufacturing jobs). The West is not creating any wealth by shuffling paper around and creating more debts. Every 4-6 years we have a crisis and the West is going into this next one with more debt than we had before. The West will not be able to increase its debt like we did in the last financial crisis. So the crisis will be worse. After the crisis, debtors won’t own much. All bond managers should find other work because they are on the cusp of a bear market. The last bear market in bonds lasted 30+ years. In fact, everyone in finance should get into agriculture. The average age for farmers is 58. Commodity bull markets historically last 18-20 years and like any bull market can experience 50% corrections. He prefers to own the actual commodities, not land or the companies. The stock market will hold up in 2012 because politicians have elections across the West and will print and patch it all together to get themselves reelected. But in 2013 and 2014 we should panic. Obviously, we agree with Mr. Rogers on everything but the timing. 2008 was also an election year. Perhaps we read too much into things. But look at the contrast of the Super Bowl halftime show between Prince’s “We Will Rock You/Let’s Go Crazy/Baby I’m A Star/ Proud Mary” in 2007 to Tom Petty’s “Free Fallin'” in 2008. We assume that for an event this big, planners have a pretty good idea of the mood of their audience and they schedule accordingly. It’s hard to deny that public sentiment didn’t go from rockin’ to free fallin’ from 2007 to 2008. So if a Prince was ruling in 2007, to top that in 2012 they had to go get the ‘virgin mother’ herself to represent the Egyptian cow goddess. (Hathor, ‘Mistress of the West’, was the Egyptian goddess of music, dance, foreign lands and fertility.) Madonna, complete with golden horns, entered the Super Bowl Halftime Show with all the extravagance of her role. Besides a golden cow, the 2012 Halftime Show entailed a tightrope walker, cheerleaders, the ‘Party Rock Anthem’, marching band and ‘Like A Prayer’ as the finale. Frankly, that sums up the financial world just about right. Copyright ©2012 Lamont Trading Advisors, Inc. Paul J. Lamont is President of Lamont Trading Advisors, Inc., a registered investment advisor in the State of Alabama. Persons in states outside of Alabama should be aware that we are relying on de minimis contact rules within their respective home state. For more information about our firm visit www.LTAdvisors.net, or to receive a copy of our disclosure form ADV, please email us at advrequest@ltadvisors.net, or call (256) 850-4161.